Motorists in Texas couldn't conceive what they were seeing as a male clung onto the hood of an evidently damaged automobile driving down a busy street. The guy on the hood, Zane Wallace, claims just moments before the video clip was captured, he was rear-ended by the driver of the white automobile. When he walked to evaluate the automobiles as well as the driver, he states that the individual attempted to depart the scene. How cool is this? A family synchronizes Christmas lights to AC/DC’s “Thunderstruck.” Every rock fan should love this! 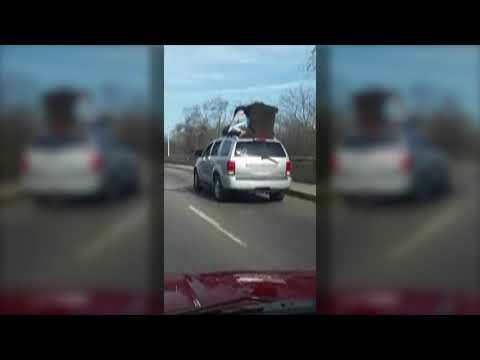 This guy decides to hold down the couch while riding on top of a moving vehicle!